In general, all vehicles have gears which control the speed of the vehicle. These gears are used to control the speed. Till now, the research is going on to increase the fuel efficiency only by introducing of new fuel system or reducing the body weight or changing any component of the engine. 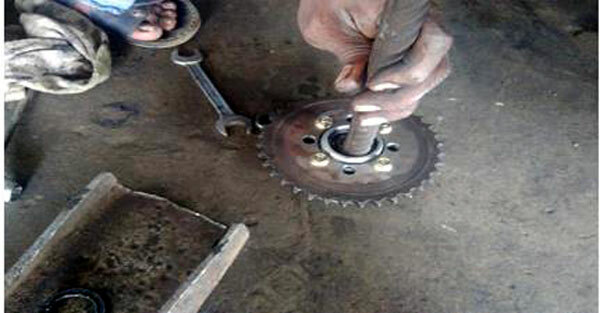 Very few researches have been done in increasing the mileage using gears. For the improvement in fuel efficiency / increasing the mileage and performance we are going to make use of the normal gear system which is in our regular use by changing the gears in a simple ratio. Usually if the gear size is reduced the torque might drastically fall down. But in this project the torque is compensated with the mileage and speed so that there is no comparative fall down of torque. This can also be used when the load is less at heavy vehicles. This project uses a simple gear transmission kit which drastically improves the performance, speed and mileage of the vehicle. This saves a huge amount of fuel and provides a smooth drive. In this project, gears with special transmission system is modified which can be used both in light and heavy vehicles. Especially in heavy vehicles, this saves a lot of fuel. The kit increases the mileage, torque and speed by 50% to 100% in any vehicle. It is economic and has many environmental profits. Hence the main uniqueness of this innovation is promoting mileage, fuel economy and speed using gears with compensating of torque. Giving birth is a natural process and most women have to go through it. There are so many commonly traditional positions of mothers in doing the birth process, but only two among them are famous. Those are lying down position and half seating position. Lying down position (lithotomic) is a position where the mother lies on the obstetric bed with both of her legs straddling and hanging on the leg holder. This is a good position for the doctor to help the birth process. The baby’s head is easily handed on the right direction. However, this position makes the mother difficult to push the baby out due to the gravity of the mother on the bottom and parallel with baby’s position. Half seating or Semi seating position is a position where the mother sits on the obstetric bed with the back supported by a pillow and both of her legs are opened. This position is more convenient and makes the baby’s way out shorter and provides good oxygen supply. A Gyn bed or obstetric bed is usually used for giving birth Process. This bed gives comfortable feeling and reduces the risk of back pain, leg muscle stresses and keeps assuring the open ways for baby’s out. Every pregnant woman needs extra physical condition that is crucial for a smooth process of birth. If there are no hospital facilities for the patients during labor process then that will pose a problem. 18 million: the estimated number of additional hospital beds the WHO African Region would need to match the bed density in the rest of the world. The large amount of thermal energy generated during machining and grinding at high speed and feed rate raises the temperature at the cutting zones excessively. This elevated temperature level under large cutting stresses accelerates plastic deformation and wear of cutting edges leading to increased cutting forces and premature tool failure. 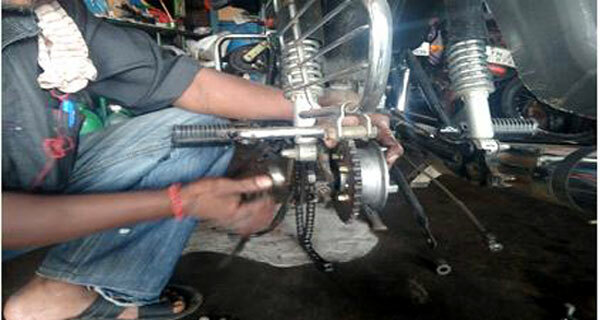 Cooling with conventional cutting fluids in the form of jet or mist is unable to solve the problem. In such cases cryogenic cooling by agents like liquid nitrogen will improve the situation. In the case of cryogenic grinding, the liquid nitrogen from a reservoir under air pressure comes out a jet from a nozzle to the spot where cooling is desired. The jet impinges on the work surface at the grinding point from a suitable distance and angle. The amount of temperature reduction due to cryocooling will increase the grinding depth. Because of the extreme cooling action, the life of the grinding wheel\s will be increased. Biodegradation is the process in which microorganisms like fungi and bacteria degrade the natural polymers (lignin, cellulose) and synthetic polymers (polyethylene, polystyrene). Microorganisms degrade the polymers like polyethylene, polyurethane by using it as a substrate for their growth via enzymatic action (this can be any enzyme- extracellular or intracellular) into metabolic products (e.g., H2O, CO2, CH4, biomass etc.). It is the safest method of breakdown that possibly leaves behind less toxic residue and shows potentials of bio-geo chemical cycling of the substrate. The efficiency of degradation is high. Significant reduction in the percentage of polyethylene pollution. The proposed project delivers the innovative stage as a solution for the treatment of the effluents. The pretreatment column designed reduces space and time. The packed bed bioreactor with activated carbon, saw dust etc and pure inoculum in each layer leads to the adsorption of the organic particles, dye residues, inorganic compounds. The addition of various dissolved solids get degraded or adsorbed by each layer of the bioreactor. The reactor is designed in such a pattern that the implementation is easy, consumes less space and also provides a cost effective treatment of the waste water. Water is one of the most important compounds of our life. 75% of the earth is surrounded by water, but only 3%-4% of the water is fresh water. We waste gallons of water every day as sewage, industrial waste water steams etc. the water are ultimately mixed with sea water and hence turns salty. The sewage and Industry effluent waters are the biggest concern as only a part of it is replenished back while maximum of it is released untreated. The water is not only wasted but also leads to the death of many aquatic organisms and eutrophication for non-aquatic organisms. Thus treatment to the waste water is the major topic of discussion in the nature friendly society. Treatment plants, screenings and government aids have been developed for the control of sewage water and industrial effluents. But the cost effectiveness, time and manpower has become the major issue to avoid such process but release the water. The conventional methods of treatment in the common effluent plants and the industry effluent sectors consumes huge amount of time, space and cost. Due to these factors many of the micro industries undergo little or no treatment and release it into local bodies, lands. This leads to the damage of the public health and aesthetic value. The river Noyal in the Tirupur district of Tamil Nadu is contain a high Biological Oxygen Demand(BOD) and Chemical Oxygen Demand (COD) level than any other river. The colour and odour of the river water are objectionable. This provides a clear landscape of the future perspective of the water pollution. The proposed topic develops on the improvement of the conventional techniques. Hence the rate of treatment can be increased. The cost of treatment is also reduced than the current treatment process. 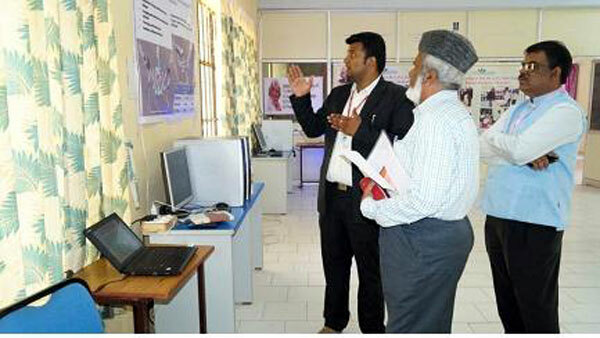 It also provides a scheme of implementation drawing the attention of the investors. India is one of the fastest growing economic countries. Hence the urbanization is expanding manifold. The area per person of free land space is also decreasing. Fewer trees are available in cities. This has become the major threat by aesthetic reasons, global warming reasons and cleanliness of air. Gardening has become the utmost reach to increase the green landscape. A proper method of increment in the greenery is most needed in the fast growing urban areas. The proposed technique of practicing aquaponics using the treated effluents shall meet the requirements of expansion of the greenery. The amount of agricultural production shall also be increased than the present rate. The fish culture will be a solution to the huge amount of protein deficiency in the country. The rate of availability of the fish will also be increased. Thus, a proper vision is developed where the objective does not lie on the beneficiary of the entrepreneur or the investor but also to the Government. The subsidy cost shall also go down by the implementation of the project. The environment and the common citizen of the nation shall also be an indirect beneficiary by the increased amount of greenery and nutrients in the dishes. Increase in the treatment of the effluent before releasing out. Eutrophication and bio magnification gets reduced. The protein increment in the regular diet of the citizen of the nation. The crop growth and yield increases. Due to high Nitrogen,Phosphorus, Potassium value in the effluent. The water scarcity can be overcome by the usage of EWB. When there is plenty of water available during rainy seasons it can be purified and converted into Edible water bubble and stored for longer time. Healthy diet and consumption of variety of foods should ensure adequate supply of vitamin to the body. Multivitamin microcapsules are applied in medicinal uses for children’s with vitamin deficiency. As children are weak in taking medicines like syrups and tablets, microencapsules can do a better job. This formulation of multivitamin microcapsules is based on EWB methodology. Energy drinks are the easiest way to keep you active and energetic during long journeys and during sports activities. These types of jellys give refreshment to the body. The fruit jellys which are free from preservatives will become the good source for food industries to develop. The use of Food grade chemicals gives no side effects. According to the material safety datasheet the sodium alginate, calcium lactates do not cause any toxicological effects. Children’s who hate to consume fruits can be attracted to fruit jellys because of the unique structure and attractive colours. 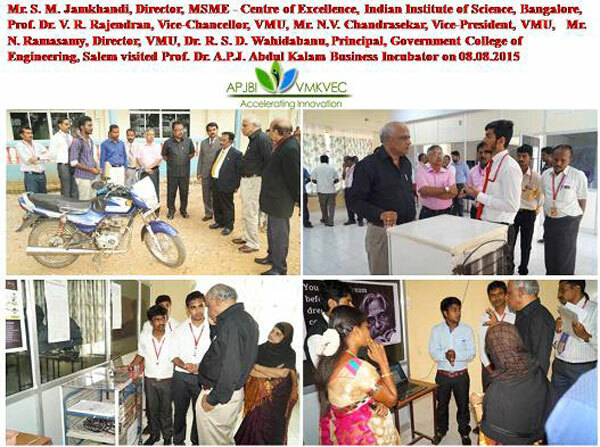 Prof. Dr. A.P.J. 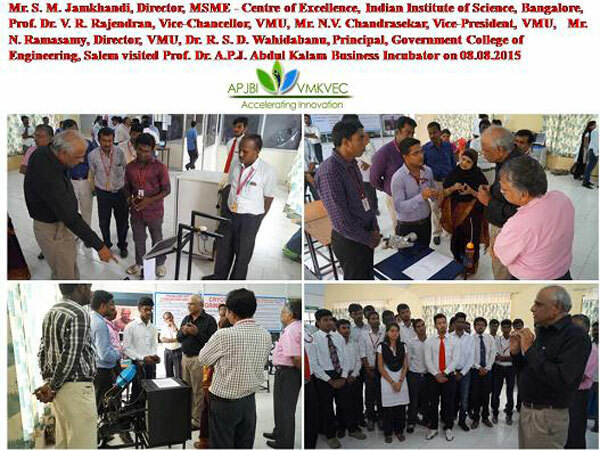 Abdul Kalam Business Incubator of Vinayaka Missions Kirupananda Variyar Engineering College, Salem is recognized as Business Incubator under one of the schemes of NMCP called “Support for Entrepreneurial and Managerial Development of SMEs through Incubators” by Ministry of MSME, Government of India, New Delhi. 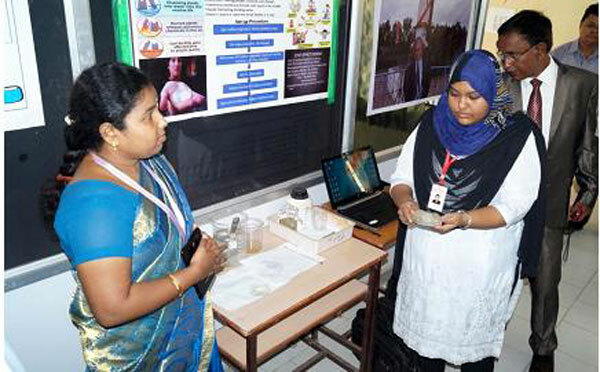 The project entitled “Application of Enzyme extracted from Aloe Vera plant in Textile, Leather and Paper Industries” has been selected for funding to the tune of Rs. 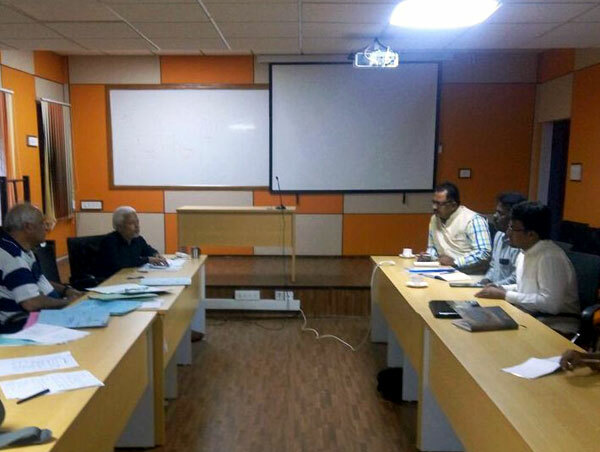 6.25 Lakhs by the Expert Committee headed by Development Commissioner, Ministry of MSME, Government of India, New Delhi. The project embodies the best of green chemistry in textile, paper and leather industries and also integrating agro-sector and industrial sector. 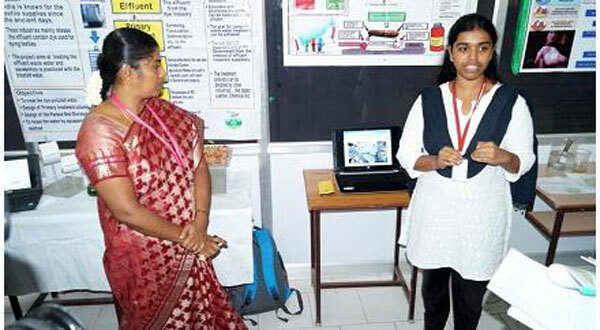 The project has explored the unique nature of Aloe Vera plant to develop organic enzymatic eco-friendly chemicals for textile, leather and paper manufacturing industries. The significant advantages of the project is to preserve our natural resources especially land and water in a sustainable way. Now a days, highly alkaline chemicals like caustic soda, soda ash, silicate, acetic acid and soaping agents are used for scouring to remove the non-cellulosic impurities from the cotton. Use of 30 -40 gm/Kg on weight of the fabric, results in destruction of cotton structure. Intensive rinsing and more acid is needed for reutilization of cotton, which enlarge the volume of effluent .Furthermore, these hazards chemicals results in increase in COD, BOD and TDS in waste water .These chemicals also attack the cellulose leading to heavy strength loss and weight loss in the fabric .The net result is low quality control and polluted environment with high usage of energy, time ,chemical and water Aloe Vera presents the finest commercial opportunity in various industrial sectors among the various plants. Also, most of the countries gifted with the unique geographical features essential for cultivation of Aloe Vera. Yet, none of the country has not realized and reaped the full potential of such plants in various industrial applications. The reason is simple: lack of the requisite expertise in extraction of various enzymes present in aloe plant Fortunately, the technology is now accessible to make use of enzyme in textile, leather and paper application. It reduces volume of effluent as well as COD, TDS and pH. It saves a substantial thermal energy 50 % and electrical energy 40%.Bio scouring waste water has 40 -50 % less COD and 60 % less TDS as compare to conventional industrial waste water. Economic benefits of bio scour (Indo Bio soft) over conventional Pre treatment process Economics for each process was calculated considering all the details like chemicals, auxiliaries, water, electricity and labor costs. It is observed that cost of processing fabric in traditional method is around1.32 USD /Kg, whereas costs of one stage enzymatic processed fabric was 0.5/Kg USD respectively. The net cost saving in enzymatic process is 0.82 USD /Kg. Majority of the bikers in our country are not willing to wear the helmet even after knowing how fatal it would be if an accident occurs. This technology enhances safety while prohibiting ignition of the vehicle if the user is not wearing the helmet and if the user has consumed liquor. Thereby enforcing the user to wear the helmet and prevent liquor consumption during driving, which will utterly eradicate the drunk and drive issues throughout the country. The system also checks and controls the speed of the vehicle automatically while entering speed limit zones like Hospitals, schools, colleges, etc. The system allows the user to remotely monitor the vehicle and control vehicle ignition during theft. To increase the safety level to a higher extent, the system also has the ability to sense the occurrence of an accident and immediately sends the location details of the vehicle to several emergency contacts like Ambulance, Police, friends and family who could bring help as soon as possible. 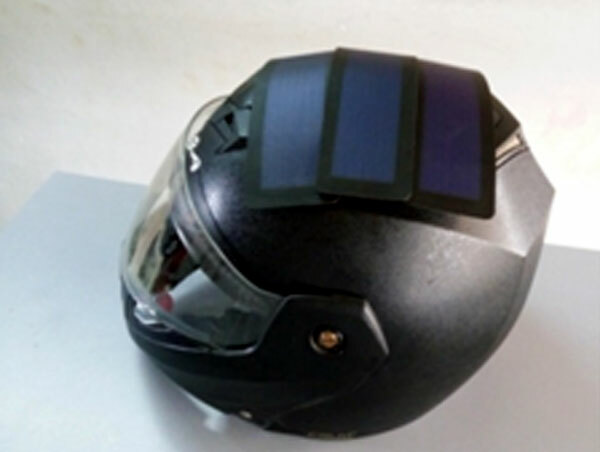 The surface of the helmet incorporates a flexible solar panel which helps as an independent power source for the helmet system. It also has a mobile charger port which would help the user to charge their mobile phones while travelling. The system provides the blind people a practical and best solution by fulfilling their needs. The system comprises of a Windows phone. The whole system is based on a windows application. It uses the camera to read the text in front of the person and convert the extracted information into voice through the text to speech algorithm in an effective manner. This will help them in object identification, text recognition, and text to speech conversion while conveying it as voice output. This system is used as a self- assistive, efficient and portable device to guide and make the user feel independent from being dependent on others for navigation. With the help of GPS, the system acts as an offline navigation device that uses 3-D sounds to provide navigation instructions to the user. There by ensuring a simple, accessible, inexpensive and discrete aid for visually impaired people. 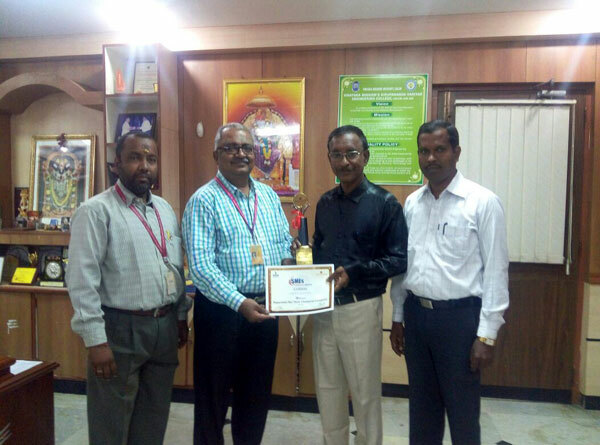 Incubatee Mr. C. Thiagarajan along with the mentor Dr. T. Muthumanickam, Professor and Head/ECE and Dr. A. Nagappan, Principal, explained the project during review meeting held on 26.10.2016 at Bangalore to Prof. H. S .Jamadagni, Principle Investigator, MSME- CoE, IISc, Bangalore and Mr. S. M. Jamkhandi, Director, MSME- CoE, IISc, Bangalore. Food waste is produced in all the phases of food life cycle. About 42% of food waste is produced by household activities, 39% losses occurring in the food manufacturing industry and 14% in food service sector, while 5% is lost during distribution. 300 tons of oil barrels are used for the production of the total amount of food around the world. This amount of oil also gets dumped with the food waste. Raw fruit &vegetable peels, fish parts, animal residues constitute the part of the total food waste. The increasing population is giving rise to the high amount of food waste that is dumped in the landfills. This huge amount of waste increases the Biological Oxygen Demand and Chemical Oxygen Demand level of the local water bodies when carried off by the surface run offs into the ponds and rivers. The process of incineration and composting treatment leads to the complete loss of the nutrients. A number of valuable bioactive compounds can be obtained from these food wastes for the production of nutraceuticals, functional foods, and food additives. Fish wastes can be used to produce oil, protein, calcium, bio-diesel and numerous bioactive compounds. In particular, fish oil is rich in omega-3 fatty acids which can aid prevention and treatment of various diseases. The main objective of the proposed work is to extract valuable biomolecules such as omega-3 fatty acids, proteins and carbohydrates from fish and animal wastes, characterization of the extracted molecules and its applications to produce nutraceuticals and functional ingredients. 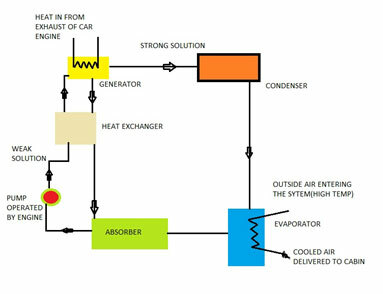 The main objective of the work is to design the refrigeration system by utilizing waste heat from exhaust of the engine. For automobile air conditioning normally vapour compression refrigeration cycle is used which runs on engine power and consumes around 10% of the total power produced. In case of automobiles large amount of heat of the input, around 60 % is going as waste. The principle behind refrigeration is that it uses three gases to accomplish its cooling effect namely ammonia (refrigerant) water (absorbent) and hydrogen. Ammonia is used as the refrigerant as it is easily available, environmental friendly and can produce a better cooling effect. Hydrogen is used to reduce the partial pressure of ammonia vapour in the evaporator chamber so that more ammonia evaporates yielding more cooling effect. Heat input is required at the generator where aqua ammonia is heated to get ammonia vapors. Experimental setup for refrigeration system is made using heat engine energy to supply input heat. The aqua ammonia solution tank (generator) is fitted with the exhaust pipe of the engine. So heat from exhaust gas of the engine will heat the aqua ammonia solution. So that, ammonia alone vaporized from aqua ammonia solution because boiling point of ammonia is less than that of water. The rest of the system is unaltered. 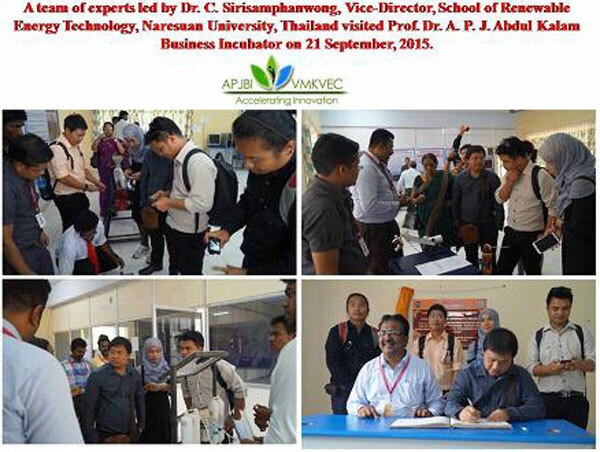 2 S. Iswarya Effective bio-degradation of waste polyethylene using potent microbial strains and its methodology based applications. 4 Hari Krishna K.S. 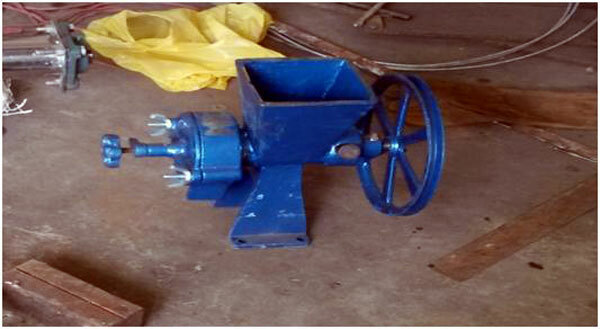 Design and fabrication of leg holder for supporting rural woman in labor process. 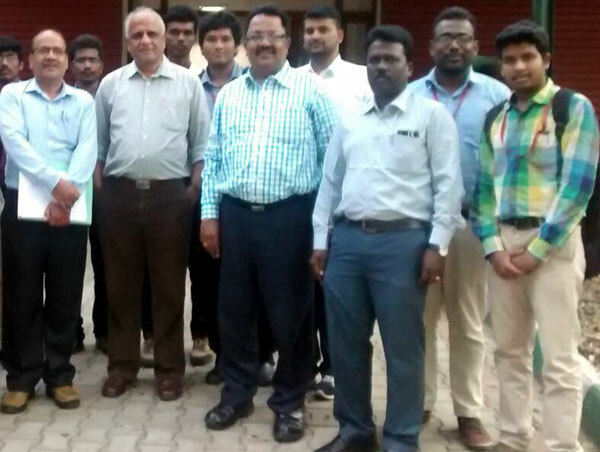 5 Sambhasan Banerjee Design of textile effluent treatment plant and implementation of aquaponics. 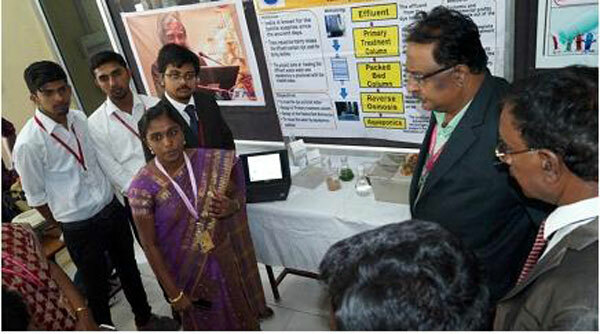 7 D. Jothi Application of Enzyme extracted from Aloe Vera plant in textile, leather and paper industries. 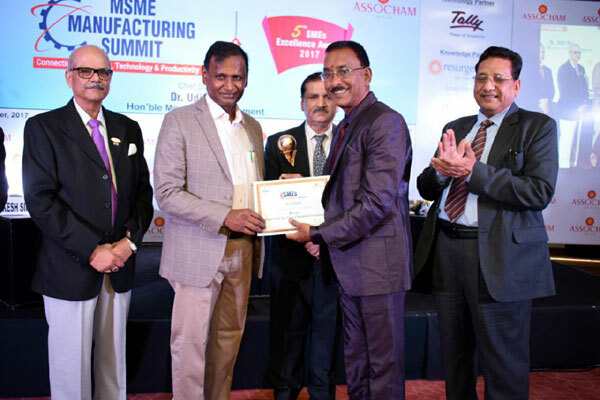 Grant sanctioned for implementation of the scheme "Support for Entrepreneurial and Managerial Development of SMEs through Incubators” to the tune of Rs. 10,75,000/- from Ministry of Micro, Small & Medium Enterprises, Government of India for the following projects.